The best replacement windows deserve the best installation! Here’s the Dreamstyle Remodeling step-by-step window installation process. By adhering to this proven process, we ensure a perfect installation on every Dreamstyle Remodeling Pella® window replacement project. Prior to the start of the project, a representative from Dreamstyle Remodeling will visit your home to take custom measurements. Each Pella® replacement window and door will be custom built to exacting project specifications. 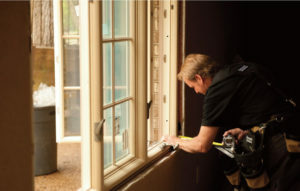 The day of your scheduled installation our team of Pella® replacement window experts arrives on time and ready to go. Our truck is a fully equipped “window workshop” with everything we need to perform the job, even our own power source. Once inside your home, our team works quickly to protect or move any of your possessions that are in the vicinity of the windows. They lay drop cloths around the area to protect your floors. As a final precaution, each member of the crew wears protective booties to avoid tracking dirt and mud into your home. We begin removal of your existing windows, taking all necessary precautions to protect your drywall and the area surrounding the window opening. We haul away your old windows, recycling the components that are recoverable, and properly disposing of others. We carefully remove your new windows and pre-position them for installation. Each of our crew members is an experienced professional who is factory-trained in the proper installation techniques. You’ll be surprised how quickly your new windows go in, thanks to the custom sizing and manufacturing of Pella®. There may be a small gap between your new windows and the frame of your house. We fill this gap with an expanding foam that has been specially designed for composite windows and doors. This foam creates an airtight seal that will limit energy loss in all weather conditions. To complete the look of your new windows we install precisely measured and custom colored trim. The combination of the insulating foam and the snugly fit trim creates a water and airtight seal against the elements. Once we finish the trim, we thoroughly clean our work site, replacing anything we have moved in the process. We wash each new window, remove any protective film, and leave you to enjoy the view through your beautiful new replacement windows! Dreamstyle Remodeling can make your home more attractive, comfortable, and energy efficient with Pella® replacement windows in Albuquerque, Santa Fe, Tucson, Northern Arizona, and San Diego homes. Let’s get started with our free, no-pressure, in-home consultation. We’ll schedule it when it is most convenient for you!